This is it, folks. Eurovision week is finally here. And that means that our Countdown To Eurovision series is almost at an end for another year. But we’ve still got two countries up our sleeve and today… it’s Moldova’s turn. 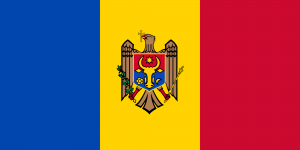 2016 marks the 12th successive year that Moldova has been part of the Eurovision competition. But despite its best efforts, the tiny Eastern European country’s best result was in its debut year – back in 2005. In the 2014 and 2015 editions of the event, the Moldovans didn’t even make it out of the semi final phase, so Lisia Isac, who attempted to represent her country as part of a group for the past three successive years, is here in solo guise in an attempt to turn those fortunes around and secure Moldova’s place in the Grand Final on Saturday. ‘Falling Stars’ is one of those high-energy dance/pop numbers that feels a little like it belongs back in the 1990s. There are, then, certain sections of the Eurovision community that will love it. But it doesn’t feel special. Cinq points.